This is a privately owned unit and guests are renting directly from the homeowner Andrew Oleksyn (whose company name "KL 3-403" will appear on your credit card) through Vacation Realty Hawaii. Therefore your reservation is non-transferable between other properties. This condominium is professionally managed by Vacation Realty Hawaii LLC 808-822-0272. Check-in time is 3 PM and checkout time is 10 AM. Please be certain to plan your arrival and departure times accordingly. We have a very tight cleaning schedule and the housekeeper will likely arrive at 10:00 to begin the clean. Extra charges apply if you have not departed at 10:00 as we have to compensate the housekeeper for wait-time. If you need an early check-in or late check-out we recommend you book an extra night. Resort Fees: KOLOA LANDING WILL CHARGE YOU $128 PER DAY PLUS TAX FOR RESORT USAGE. THIS COVERS WIFI, 24 HR FITNESS CENTER, BUSINESS CENTER, LOCAL CALLS, PARKING, BBQ AND RESORT POOLS. THE GUEST IS RESPONSIBLE FOR PAYING THESE CHARGES, DUE AT CHECKOUT. Resorts that require “resort fees” for guests staying on the property solely make the decision on what the amount of the fees will be and it is out of the control of the owner of this property. These fees are subject to change at anytime without notice and could change before your arrival and could be different than the original fee stated in your reservation. We make every effort to communicate changes in fees as soon as we are notified. A $250 security deposit is required with this reservation and we will process a credit card authorization in that amount prior to your arrival. A charge may result for damage to the condo, missing contents or for exceeding the stated number of overnight guests. If a guest arrives without notice earlier than the scheduled check in time of 3pm or fails to depart by the required 10am checkout time, their security deposit which is on hold will be charged in full. Our units hold very busy time lines and the failure to leave on time can cost money and schedule disasters. Likewise arriving earlier than scheduled can disrupt the busy cleaning flow, cause mishaps and confusions with the housekeeping staff. Damage in excess of the $250.00 security deposit will additionally be charged to your credit card commensurate with such damage. Guests are responsible for reporting any damages immediately to the on-island contact Graeme D. Merrin, RB, ABR, GRI, 808 822 0272 or graeme@graememerrin.com. A maximum of 6 guests may occupy this 2 bedroom unit for the regular nightly rate. $15 per additional guest over the normal occupancy number is charged per day (any more than the 4 guest who can sleep in the beds) for those units that have additional accommodations. This charge covers our additional expenses in laundry, electricity, and the setting-up/breaking-down of sleeper sofa. Guests are obligated to disclose the actual number of occupants prior to arrival. At no time should anyone sleep on the sofa. Guest must open up the sleeper sofa and use the mattress with sheets. Stays of more than 10 days have additional mandatory interim-cleaning. We do not provide daily maid service, however we do clean your unit mid-stay when you have a booking longer than 10 nights. For example if you stay for 11 nights you would have an interim clean around day 5 or 6 and a final outclean after your departure. If you stay for 21 nights you would have two interim cleans and one outclean. Smoking is strictly prohibited in the condo or on the condo lanai and doing so will result in full loss of security deposit. We have covered lanais, so the smoke gets trapped and blows into the unit. If you smoke away from the unit on the grounds of Nihilani, please be sure the dispose of your cigarettes appropriately, but not in the condo. Central air conditioning is available in all units free of charge. Please note some units have temperature controls to prevent the a/c from being set below 75 degrees. Please know that Kauai has the most expensive electricity on the island and condo electric bills run between $450 and $900 a month. Please help us to conserve electricity and keep our rates down by turning off the a/c when you are not home, keeping blinds closed during the day to keep the condo cool, and keeping windows and sliding doors closed when you are running the a/c. If the a/c is run with the window and doors open it will freeze the compressor and render the a/c unusable for 48 hours while it defrosts. Please make sure that all keys, towels and remotes are left behind at the condo when you depart. We charge a fee of $50.00 for any missing beach or bath towels upon checkout. Generally these are lost because they are left in the rental car, so please check your car carefully before you leave for the airport. Keep indoor furniture indoors, and outdoor furniture outdoors. There is a $50 fee if furniture needs to be moved back to its original place upon your departure. For example, if you move a large table, the management company will have to send a second person to help the housekeeper put it back. Hurricane or Storm Policy: No refund will be given unless a “mandatory evacuation order” has been given by the National Weather Service for this area. In the event a mandatory evacuation order is issued we will refund unused portions of rent of a guest currently occupying the property and any advanced rents or deposits collected for a guest that is scheduled to arrive during the Hurricane Warning period. No pets of any kind are allowed, unless they are a certified assistance animal. The illegal presence, possession or use of non-prescription drugs or other controlled substances is not permitted anywhere at Koloa Landing. GUESTS ARE RESPONSILBLE FOR FOLLOWING THE HOUSE RULES OF KOLOA LANDING. Violation of the rules can result in fines, and guests are responsible for paying those fines. In severe cases if guests are permanently removed from the condo and from the grounds of Koloa Landing by the homeowner, property manager, resident manager or the police the guest will not be refunded for rent paid for unused nights, even if the guest is prohibited from returning. SDC Properties Inc., is the sole owner of the information collected on this site. We will not sell, share, or rent this information to others in ways different from what is disclosed in this statement. SDC Properties Inc., collects information from our users at several different points on our website. This web site contains links to other sites. Please be aware that we, SDC Properties Inc., are not responsible for the privacy practices of such other sites. We encourage our users to be aware when they leave our site and to read the privacy statements of each and every web site that collects personally identifiable information. This privacy statement applies solely to information collected by this Web site. We were blown away when we walked into this condo! From your private entrance from the elevator to the gorgeous views from the lana, it is 5 star all the way. The kitchen is a gourmets delight, the bedrooms and the bathrooms are all upgraded and beautiful. The laundry room has a front loader washer and dryer and all the beach equipment you might need, including a cooler on wheels, boogie boards and 6 very nice high-end beach chairs. This condo had all the little touches that made it very homey, all the pots and pans and kitchen equipment was new, the Tv's worked perfectly, the furniture was new and clean. The grounds were well manicured, including a small 9 hole putting green. The unit overlooks the amazing pool with a small island in the middle, it also has a wheelchair lift for the pool,such a nice touch. There is an adult pool on the property but we never made it there as we had our kids with us. There was construction on the other side of the property but we never heard it nor were we inconvenienced by it. The condo is close to everything you might need. We went through Kristin at aloha Condos, she was great! I'd recommend this condo and Kristin with aloha Condos. Enjoy! Upgraded Koloa Landing luxury Condo! Beautuful 2 bedroom 2 Bath with peeks at the ocean, mountain, and pool views. This exclusive, oceanside resort community is made complete with luxurious five piece bathrooms and fully equipped gourmet kitchens, including granite countertops, custom cabinetry, Sub-Zero refrigerators and Wolf appliances. BRAND NEW with top of the line appliances and dishware! BRAND NEW king bed with high thread count linens. Large 2 bedroom 2 bath with full kitchen and living areas. Aloha!This was our second time staying at Koloa Landing, but first time in this unit and first time after the newly added pools and restaurant. We enjoyed the condo immensely! It was well stocked with high chair, pack n play, beach chairs and boogie boards! The kitchen had all the gadgets and utensil one could ask for! This unit was clean and the perfect size for our family of 4. It was quiet and comfortable, with a large lanai for outdoor eating and relaxation! We cannot wait to return!Mahalo! Thank you for your comments about the unit 3-403 at Koloa Landing. It is a great resort with beautiful and fun amenities and the unit itself is stocked with all you will need for a great vacation! We are so glad you enjoyed it and found all the beach gear a special touch. The large lanai is a great space too! We do hope you will return! Thank you for taking the time to post a review in response to our request for the unit 3-403 at Koloa Landing. This is a great condo and is well appointed the some of the furniture has just been purchased brand new so thank you for commenting on it. We are sorry to hear that you were concerned with the cleanliness. We really wish you would have called us right away so we could have sent someone there to take care of whatever your concerns were instead of waiting till after your departure. We do want to make sure everything is set to a high standard for each guest. Kauai is a tropical island so there are pest that we need to be attentive too. The ant traps were put there about two months prior when a guest allerted us. However we have not had any complaints since and it sounds like you did not have any either so hence the ants traps work! We appreciate your review for the condo 3-403 at Koloa Landing. It is a really well decorated and upgraded condo in a great resort. We are glad you enjoyed the pools and do hope you can come again to this spot in paradise! 3rd Stay in Condo 3-403! This was our 3rd time staying in this beautiful condo and it felt like home when we walked in. The view, the kitchen, the comfortable beds, the beach stuff and location make this condo a wonderful place to stay. Our favorite part is the eating together as a family on the lanai and being able to cook a few meals. We've been here twice during the construction and you can't hear anything when the doors are closed. The construction did not affect our stay at all and it looks like the property will be even more beautiful once completed. I can't imagine coming to Kauai and staying any place else! My wife and I stayed here for eight nights in November and had an amazing time. The condo was beautiful and very spacious. The kitchen was a great size with nice finishes. Parking was easy and the elevator for the condo was right by the parking lot. We found the condo to be in a great location close to both the Poipu shopping village and the Kukui'ula Village shopping center. You can easily walk to both locations and grab dinner or some Lapperts Ice Cream. The condo had a great view of the pool and you can see the ocean from multiple angles. There was construction going on while we were there but we barely noticed it. We had a small problem with the washing machine but the management took care of it very promptly. The laundry room is packed with all the beach gear you could want. We loved using the body boards, beach chairs, umbrella, and mini cooler. The pool and spa were immaculate. I think we went to the hot tub almost every night we were there. By far our favorite part of the condo was the lanai. It stretched from the master bedroom to the living room. The pictures on the listing did not do it justice. It was peaceful and very relaxing. We ate breakfast on the lanai pretty much every morning. The only problem we had with the condo was the wifi. It was basically useless because it was so slow. I would hope with the relatively high resort fee that you could get some better internet access. That being said it was a very small inconvenience. I would rather be at the beach than using wifi at the resort anyways. Overall we had an amazing experience and will be coming back as soon as we can! We are so happy to hear how much you enjoyed your stay at 3-403 at Koloa Landing. This is a great condo with multiple and beautiful upgrades. As you mentioned the lanai is very special and spacious! Koloa Landing is located in a great spot, close to everything! It is always nice to hear that the construction did not cause you any displeasure. Construction is a necessary thing to make the resort even more special with the new amenities etc. Thank you for mentioning that when you had the problem with the washer/dryer in the unit, we did respond right away. We do try very hard to be available immediately or as soon as possible. The unit also as you said is stocked well with beach equipment of all sorts. We want our guests to have the convenience of having everything they might need. We hope you will come again soon and thank you again for the glowing review! Needed more time to enjoy! This was the 4th trip to Kauai and Poipu for my wife and I, and Koloa Landing was by far the best place we've stayed. The property was even better than advertised and appeared via the description and pictures we saw on the internet. Definite pride of ownership! It was clean, nicely decorated, had very comfortable beds, and the kitchen had everything we needed to cook/eat several of our dinners there. We went with another couple and the two bedroom/two bath unit was more than spacious enough for the 4 of us. Although not ocean front, we loved the proximity to the beach, Poipu shopping village, and the newer Shops at Kukui'ula. The private entrance and very private lanai were also great features. We used the pool every day and it was NEVER crowded. Also, we really appreciated that the owners made beach chairs & towels, cooler, and beach "stuff" available for our use. Can't say enough about how much we enjoyed this condo and property, and we already know that Koloa Landing will be our 1st choice for any future trips to Kauai! Beautiful property. The location of the condo right above the pool was ideal. The lanai was huge and very relaxing. The beds and bedding were amazing as were the bathrooms. The layout was perfect for privacy as the master bedroom suite was on the opposite side of the second bedroom. The unit was stocked full of any type of beach gear that you could possibly want. The property grounds and pools were beautiful and well maintained. The staff was friendly and accommodating. The only negatives that I will mention are of course the massive construction area that obstructed our view and access to the beach. I was afraid that the noise would be a problem but it really didn't bother us and the workers don't start very early. I would love to come back to see everything when the construction is complete. As far as the condo goes, some of the appliances were temperamental. The coffee maker leaked and at times stopped in the middle of brewing. The fridge was nice but the door was hard to pull open at times. The dryer was not very effective and seemed to take a long time to do the job. I only mention these items to help others as they really did not impact the enjoyment of our stay and I would definitely come back again. I spent the Thanksgiving holiday at Koloa Landing Resort with my family, and we all had an excellent time. The resort is a short walk from the beach and a couple different shopping centers that have a variety of restaurants. It is only a few minute drive down to Old Koloa Town and the grocery store. Overall, the condo was in excellent shape and had everything we needed to have a great stay. The hotel grounds were well taken care of and moderately peaceful. Please note, a new phase of construction is taking place at Koloa Landing, and I believe it just started within the last couple of months. The majority of the construction is away from building 3. However, it appears new buildings are being put up between building 3 and the water. It would be good to ask in the future to see current pictures of the ocean view, because it may be limited. We always appreciate great reviews from guests like yourself who let us know that they were well pleased with the accommodations. The location as mentioned is great and close to the ocean, restaurants and shopping. Thank you for mentioning also that the construction is not right on top of building 3 where this unit is located. With the construction of new buildings, it is not yet certain how the view of the ocean will be affected. We do know that ocean peeks between the building should always be present. However for now the ocean view can still be enjoyed. We hope that you will come again and stay with us in your next trip to the islands! We rented this 2 bedroom condo with another couple for a 5 night stay. The place is beautiful and included a lot of amenities - everything from pool toys to baby gear to snorkels. The second bedroom was quite small, the bed was more like a double than a queen sized bed. Views were beautiful and the kitchen had everything you would need for a short stay. Nice to also have separate bathrooms.The venue, however, was under construction and there was construction noise on the site - something we weren't aware of when we booked. Overall a good stay, there were just some areas we were disappointed with. But I would go back if the resort was finished construction. Thank you for your review for Koloa Landing unit 3-403. We are glad you were pleased with the unit and the accommodations it provided. It is an extremely nice unit with lots of wonderful upgrades. The second bedroom does have a queen bed and is dressed in queen sheets which fit. The construction on the property is an ongoing process and does have breaks from time to time. Our website will try to keep up with the progress and the updates as we know. We have found that most of the noise is not too disruptive from inside the unit but it really depends on any given day and the type of work being done. However the construction sites are not right on top of this unit so that helps. It will be incredible when the work is complete with the added amenities it will bring. Thank you for staying with us and we hope you will come again. The condo was very spacious, quiet, beautiful, had top of the line appliances and contained everything we needed. It was in an incredible location with very close access to beaches and other amenities including a short walk to the great Ala Kalanikaumaka Shopping center which has some great restaurants and shops! Loved it and would definitely consider returning!The only negative thing in my opinion, was the steep "resort fee" of $50 p/d which is very high! The highest I've ever heard of or paid! Then to learn that this fee of which came with the inclusion of "free WiFi" actually limited guests per stay to only 2 devices in total at any one 24-hr period (we had 4 guests each with a cell phone and iPad) for the condo stay, was ridiculous! I had contacted the manager and politely vented my frustration and let them know that at that high of a fee, to limit the sign-on & use to only 2 was unacceptable! Not that vacation in beautiful Kauai is all about being able to sign onto WiFi because it is not, but the principal behind the restrictions was totally unfair! Especially because it costs nothing more to management to allow additional acess, but only yet another way to collect additional revenues (I work for a networking company in Silicon Valley). The manager actually agreed and was able to give me an access code that allowed me to bypass the limitation...thank you!All else was fantastic!! Aloha!! We are so glad to hear that you enjoyed the condos and found it to be very accommodating. It does have a great location and is close to everything and the unit itself is beautifully upgraded and decorated. The resort fee of course is out of our control but regarding the limits on the number of people using the wifi, you can give us a call next time and talk to us about that. We hope that you will allow us to accommodate you again in paradise. Thank you for your business. The condo was awesome. Beautifully maintained and decorated. Very clean and comfortable. Our family sat on the lanai during the morning and evening times, just relaxing and enjoying the island breezes. We brought our own flat pillows to sleep, because the condo had a thicker pillow that may bother some that are used to a flatter one. The pool was awesome, but at times overrun by local kids looking to cool off. Koloa Landing is close walking to the shops and only a few minutes from old town Koloa. You gotta go to the Koloa Fish Market and try the poke, it's the bomb. We are definitely coming back and would recommend this unit to anyone. Thanks for a great stay. Great location and place -- made for a great honeymoon on the South Shore. This is a great condo in a fabulous location. It is well stocked with top of the line appliances and amenities, including a pack and play and highchair, as well as plenty of sand toys, body boards, towels, umbrellas beach chairs...everything you need for a great vacation. My one complaint is the staff at the actual condo (NOT the rental agency-Aloha Condos). The hotel/condo is very short staffed...of the 10 or so times I called the front desk, I never got an answer. The elevator in our building didn't work properly and we often got stuck (for just a few minutes), but complaints regarding the elevator seemed to go unanswered. Also, there is a $50 resort fee which is really high given the lack of hotel services offered (wireless is free, but only for 2 devices, for more you have to pay an additional $10/day--come on...). The condo is great and we would definitely recommend it and/or stay here again. It is especially great for families that need/want a fun pool, the one here is great and was NEVER crowded...a big plus. Aloha and Mahalo for your recent stay with us. We truly appreciate all of our guest comments. The Koloa Landing Resort staff has assured us that the elevator problem was only a minor maintenance issue and has been fixed. Future guests interested in more than two wireless devices, please contact us, we can help J. The resort does require a $50/day resort fee, but we can more than make up for it in the nightly rate we offer compared to the hotel quotes. Koloa Landing is the newest and nicest project in Poipu at this time and without a doubt a very relaxing accommodation. The views, location and luxury are unbeatable. We hope you will choose to stay with us again. The location of this resort was centrally located to Koloa, Poipu, shopping, eating and beach time. Unit 3-403 was immaculate, beautifully decorated and fairly well stocked for cooking. Owners supplied everything you would need for the beach. The beds were extremely comfortable. Time to the Ocean is about a 7 minute walk down a nice path. Only caution is this unit is overlooking the family pool and the resort allows swimming as early as 5:30 a.m. There was a family there with young children that did not respect that others may not want to hear their children screaming early in the morning and later in the evening. Thank you very much for your comments, we truly appreciate them. We are glad you enjoyed the location of the condo as well as all the amenities. The condo is located on the fourth floor, and this is the first time we have heard of the vocal transition from the pool. The lanai doors are double paned and create a great privacy barrier. Koloa Landing is a beautiful, well maintained resort, and the only Wyndham Grand on the island. We cannot say enough about this gorgeous condo. We have stayed in many over the years but none like this one. It was spotless! It had all the amenities you would want, even spices, honey, you name it and it was provided. The condo itself was beautifully decorated and perfectly situated. The lanai, which we spent every morning, some afternoons and every evening on, was spacious and the furniture comfortable. It looked right over the main pool which was gorgeous at night with the Tiki torches and all the lights. The resort itself is perfect for couples with children -- 2 pools, one for adults only and one "fun" one for everyone else! It is also great for just couples as we are! The resort staff is friendly and accommodating as was the management company -- Kristen Greene was a pleasure to deal with -- very efficient! I could go on and on but it would just be redundant! There would be no hesitation on our part to stay at this resort again and especially this condo. No one would be disappointed renting this condo. My wife and I stayed here on our honeymoon for 5 nights and this place was top notch. The whole condo is in great condition and the view from the lanai is great. It's on the 4th floor, but there is an elevator that takes you right to the front door. We didn't use the second bedroom since it was only the 2 of us. The bed in the master bedroom was very comfortable and the master bathroom was really nice. Not only was the place in great shape, there were plenty of amentities. We didn't have to worry about much. They had bathroom towels, beach towels, boogie boards, a cooler for the beach, and an umbrella. Also, for people who are wondering, there is currently not a restaurant at the resort, but within walking distance there are two different shopping areas with great places to eat. We ate at Tortilla Republic and Roy's and had ice cream at Lappert and all were excellent. I would definitely stay here again in the future if I ever return to Kauai. The only thing that we didn't like was that we felt the resort seemed a little deserted. I know most would think that is a good thing but I like having some people around. There where many times during the day we were the only people at the pool. I guess it's still up and coming, but other than that, we absolutely loved every momment Thanks for a wonderful stay. With two teenagers, I prefer to rent a spacious condo over a cramped hotel room for our vacations. This summer, I was pleasantly surprised when Koloa Landing Condo 3-403 far exceeded my usual expectations. When we arrived for check in, the unit was clean and ready for our immediate occupancy. The woman at the front desk was friendly and efficient, presenting us with shell leis as an added welcome. In fact, all of the staff members at the resort were very friendly. That aloha spirit is what makes Hawaii such a great place to visit. The unit itself is on the top floor of Building 3, so it has a spectacular view of the main pool area and the ocean in the distance. The condo is large and beautifully decorated. There is a full kitchen, two bedrooms, two bathrooms, and a separate laundry room full of pool towels and other beach supplies. What we particularly liked was the balcony which extends across the length of the unit. It has a dining table and wicker lounge chairs. We spent a lot of time on the balcony, eating dinner and watching the sunset or simply reading a good book. I chose the Koloa Landing resort because it provided many amenities which my family wanted: air conditioning, a jacuzzi at the pool area, a fitness center, and a view of the ocean (although the complex is not really ocean front). I actually liked the location of the resort. Since it is on the edge of Poipu, we could get to the main highway a little more easily. My husband particularly liked the fact that we were relatively close to Waimea Canyon. What I liked best about the condo was the gorgeous view and the high end features such as the granite counter tops, the luxurious bedding, and the spacious master bathroom. Probably if I had to mention any drawbacks, I would have to say that the dryer was a little slow,the tile floors could be noisy, and the sleeper sofa was very uncomfortable. Still, it is a wonderful condo in a great location; I would definitely stay here again. From its upscale decoration to its wonderful grounds and pools, Koloa Landing is the best resort I've ever booked. I visit Kauai at least once a year, and this resort has all the others beat. Convenient to wonderful restaurants and family-friendly-beaches, Koloa Landing offers guests a wonderful place to call home after exploring the island. Be sure to include a walk to the beach from the resort's pathway. You will exit the grounds overlooking the ocean with water cascading onto volcanic rocks. We saw turtles every day there! Having beach chairs, coolers, towels, and even snorkeling gear available with the unit was a wonderful (and well used) surprise! This resort will exceed your expectations. I will definitely book this condo on my next visit! We had a great 4 nights in the condo. It was in great condition, nice layout and roomy. We loved sitting on the lanai which overlooked the pool. Nice view, too of the ocean. Although we had no kids with us, the pool/toy selection was impressive. We should have used the beach chairs on our first day at the beach, waited until the last day and wondered what we were thinking to wait to bring those along. Very clean and well tended.Everything was great, no complaints! We stayed at this unit over Christmas and New Years 2012. The unit was well equipped and afforded a beautiful view of the property, pool and the ocean. The master bedroom was huge as was the en suite. The 2nd bedroom was perfect for our children. The appliances were all state-of-the-art. It felt like the property was centrally located to anywhere we needed to go. The hotel staff that we encountered were very helpful and friendly. The cleaning service attended once during our stay and we felt that was unnecessary and it was an added cost. All in all, beautiful unit, would stay there again. Thanks! We had a wonderful time staying at this condo. It had almost everything we needed! Beach chairs, parasol, and toys. We cooked almost every meal in the kitchen. Kitchen was equipped with good amounts of pots and pans, blender, even mixers and baking trays. The view of the pool and ocean was also great.Very convenient only few minuets drive from Pocipu Beach, and shopping centers. The pool was large and very clean. My kids enjoyed playing soccer on the field next to the pool. Fitness center was very clean and it was equipped with towels and water. Only one complaint was the Master Bedroom's bed spring was wearing out, and it was uncomfortable to sleep in. We would like to stay here again when we have chance to come back to Kauai! We were blown away when we walked into this condo! From your private entrance from the elevator to the gorgeous views from the lana, it is 5 star all the way.The kitchen is a gourmets delight, the bedrooms and the bathrooms are all upgraded and beautiful.The laundry room has a front loader washer and dryer and all the beach equipment you might need, including a cooler on wheels, boogie boards and 6 very nice high-end beach chairs.This condo had all the little touches that made it very homey, all the pots and pans and kitchen equipment was new, the Tv's worked perfectly, the furniture was new and clean.The grounds were well manicured, including a small 9 hole putting green. The unit overlooks the amazing pool with a small island in the middle, it also has a wheelchair lift for the pool,such a nice touch. There is an adult pool on the property but we never made it there as we had our kids with us. There was construction on the other side of the property but we never heard it nor were we inconvenienced by it. The condo is close to everything you might need.We went through Kristin at aloha Condos, she was great!I'd recommend this condo and Kristin with aloha Condos.Enjoy! Our family have been coming to Kauai for a dozen years now and find something new every time. This time was Koloa Landing 3-403. We've stayed in the luxury hotels but find the private homes/condos much more comfortable for extended stays. This home has it all; close proximity to the beaches, restaurants, fully stocked kitchen with high end appliances, expansive pools and private elevator. Other reviewers have complained about the resort fee however this is a common practice. The Hyatt, Sheraton all have it. What this Koloa Landing does not have is the overcrowded pools and drunken patrons. Stay here, you won't be disappointed. 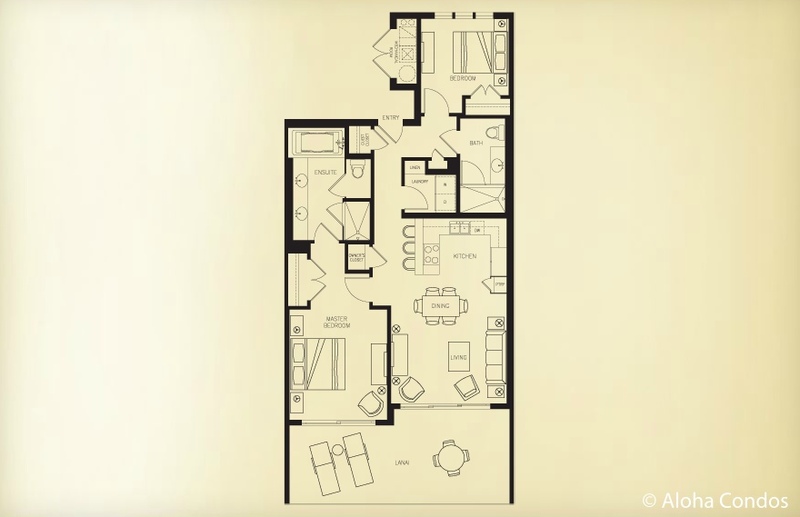 We are delighted you enjoyed condo 3-403 with all of its excellent features, especially the spacious lanai. We are very sorry about the front desk fees. They are set by the resort management and are beyond our control. We do price this condo so the total cost is competitive with the front desk rates (and their $30/nt resort fee) to compensate for the additional charge they add on. I hope you can stay with us again in the future in this beautiful condo.